On July 21st 2007, Harry Potter and the Deathly Hallows was finally released, my eager hands grabbing a copy as soon as I could. On July 23rd, I'd finished it. Like many others, I'd barely slept for two days whilst devouring every chapter. My fifteen-year-old self cried her eyes out and put the book down. I never picked it up again. Despite Harry Potter being such a huge part of my life, I've never reread the books. I'm not really sure why, and it doesn't mean I love them any less. Before Deathly Hallows was released, I'd reread the previous books several times. I've just never been one for rereading a series' after it's actually finished. Standalone books? Sure, I'll pick them up again. But a series of books I've dedicated years of my life to, given so much of my time, money, and tears to? I put them down and I move on. It's strange, when I think about. Looking back to some of my all-time favourite series', they've each changed a little part of my life, all of them shaping me in some way, changing what I look for in a story, what I expect. I love the characters, the plot twists, the moments that made me laugh and cry, but they're memories that I think back to rather than read again. Maybe it's because I've spent so long inside those worlds? Maybe once I've finally got that perfect ending, I feel like I don't need to go back to it. The characters that I've spent so long with are happy (most of the time), they're free and, as a reader, so am I. Usually, I’m content with putting them on my shelves and keeping them as happy memories without diving back in. My first ever copy of the book! Things have changed over the past year, though. Anyone who checks this blog even occasionally can see how little I've been posting compared to a couple of years ago. I've been pretty open on Twitter, and a little on this blog, about how much more I've struggled with my mental health, leaving me feeling drained and barely motivated to even read, let alone write posts. For the first time in a very long time, books haven't been a priority for me. I haven't been able to use them as my escape for a while, and it's really sucked. At the end of last year, I realised that I was putting too much pressure on myself as a blogger. As much as I try to avoid doing it, I can't help trying to keep up with the latest reads, forcing myself to finish certain books quickly so that I can post about them because everyone else has. It wasn't good for me, and reading started becoming more like a chore than an enjoyment, and I never wanted that to happen. Whilst so far this year, I've been able to get my reading back on track a little, I'm still not where I was a few years ago, and I'd quite like to be back there. So, to find my Reading Mojo™ again, I've decided to go back to the story that first made me fall in love with reading. When I say that Harry Potter played a big part in my life, I mean it really did. So many people in my generation say this, but I literally wouldn't be the person I am today without those seven books. When I was younger, books did not interest me one bit. My idea of hell was the one hour reading class in school when us students would have to pick out a book and read in silence. Back then, bored out of my mind, I had no idea that my entire being would revolve around books in the future. Until the day that my mum practically forced a copy of The Philospher's Stone into my hands, books just weren't my thing. But discovering Harry Potter opened my eyes to a whole new, literary world. It was Harry Potter that made me fall in love with books, with fantasy, with reading any exciting story I could get my hands on. I have these books to thank for the me I am today, and for every little thing I’ve achieved within the world of bookish things, including this blog. 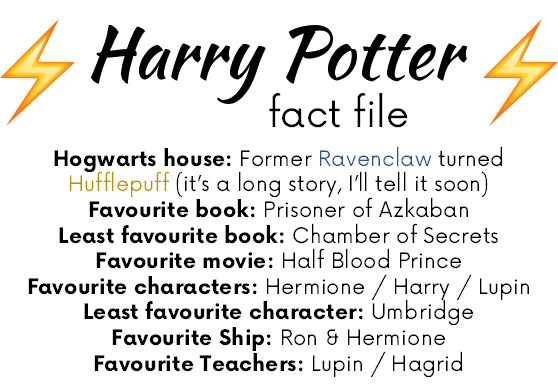 Since I was a very different person when I first picked up Harry Potter, I want to see what I take away from these books as an adult, how my feelings for certain characters have changed, and what I appreciate more now than I did when I was younger. I want to see how my general love for the series has changed over all these years. My Harry Funko. I swear I didn't break one arm of his glasses on the day that I got him. So, whilst I delve back into the wizarding world, I’m going to be publishing a series of Harry-related blog posts to document my reread. It feels like the perfect way to not only get me back into reading, but to also get me writing blog posts again. Here’s to my first ever, full reread of Harry Potter! How many times have you reread your favourite series, or what do you want to reread in the future? Let me know! I'm not much of a rereader, and I didn't reread the HP series until my son was old enough for me to read them to him. It was the best experience to be able to share these super special books with him and have him love them just as much. I will say that I had different reactions while reading them 8-10 years later. I still loved them!!! But a little bit of the magic was gone for me and I saw flaws that I was incapable of seeing with my LOVE glasses on the first time through. I'm so interested to see your new thoughts on them-- and to see if any of your fave/least fave books change-- or your ship! !